Benington (blue) v Horncastle Town (red). Colin Cheer (blue), Luke Blondel (red). Lincs League Horncastle Town edged past Benington in the Mason Bros Lincs Junior Cup on Saturday. 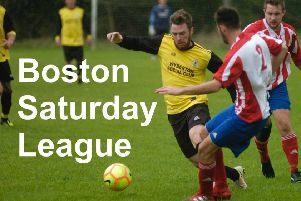 The Boston League side gave a good account of themselves in this third-round tie but Jac Wright and Luke Blondel were the matchwinners. Benington (blue) v Horncastle Town (red). Ryan Lawson (blue), Scott Lowman (red). Benington (blue) v Horncastle Town (red). Ryan Lawson (blue), Richard Jackson (red). Benington (blue) v Horncastle Town (red). Jonathan Cheer (blue), Jac Wright (red).